Articulated Hex’s coming out of the vise today ! The Muskegon river fishing report for January 29, 2019 in the Newaygo, Michigan area is about everything BUT fishing ! Due to the arrival of some pretty bitter, Midwest winter weather, most all river fishing is being put on hold while Mother Nature brings us a round of arctic weather. Both heavy snow and dangerously cold temperatures will find much of west Michigan digging out over the next couple days. Click HERE for current weather information. With the long overdue arrival of real winter weather in the Midwest, those rivers that are still open will be running at their coldest temperatures of the year and with not a lot of precipitation in general over the last month+, many are running lower than normal. Click HERE for up to date water flow data on the Muskegon river in the Newaygo, Michigan area. With similar weather forecasted through the end of the week and then an abnormal early February warm front coming through over the weekend, we’ll likely see some snow melt, but not much to affect rivers in general. As we get into the heart of winter, many peoples thoughts will start to shift towards spring and early summer activities, such as fishing ! It will start with our migratory steelhead run which finds fish coming out of lake Michigan and entering their natal rivers on the annual spawning run, followed by the best dry fly fishing of the year in late May and June, then we’ll jump right into summer fishing for Smallmouth bass and Northern pike. Prime fishing times for each of the different “seasons within a season” will vary. 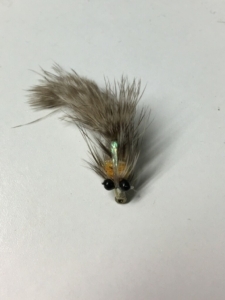 The onset of the best dry fly fishing for trout is typically around late May or early June, when we’ll see hatches of Caddis, followed by Sulphurs and BWO’s, then the biggest hatch of the year on the Muskegon river, the Gray Drake. The best dry fly fishing opportunities will continue for anywhere from 2-4 weeks, with river conditions dictating how long it goes. Come late June as hatches wind down and resident Rainbow and Brown trout are full, attention is shifted to fishing for Smallmouth bass and eventually, Northern pike as well. This will continue through the months of July and August and we can be found fishing several stretches of the Muskegon river, or even the Grand river from the Portland/Ionia area, through Grand Rapids and all the way down to near Grand Haven itself. With such specific “sweet spots” for each of the different kinds of fish we pursue in the spring and summer, getting out on the river during those times is key to having one of “those days” to remember forever !! Stay warm as we slug our way through this chilly stuff and as always, contact me with any questions about fishing or to inquire about open dates for a guided outing. Present water levels on the Muskegon river running in the 1500 cfs range and temperature in the 33-34 degree range.